This past weekend my New Orleans Saints blew past the Arizona Cardinals in an NFC Divisional Playoff game in the Superdome and we enjoyed a fresh batch of salsa with some guacamole and chips. Looking forward to the next game on Sunday, the NFC Championship Game, again, in the Louisiana Superdome when the New Orleans Saints square up against the Minnesota Vikings, we will try our best to save a little of the salsa by kick off at 6:40 EST. I have been making this salsa recipe since 1988, when I learned from a pro who had worked in Mexican restaurants, and have been tweaking it ever since. A new wrinkle in this addition of the recipe includes a 4.5-ounce can of Old El Paso green chiles, which were given to me by MyBlogSpark. 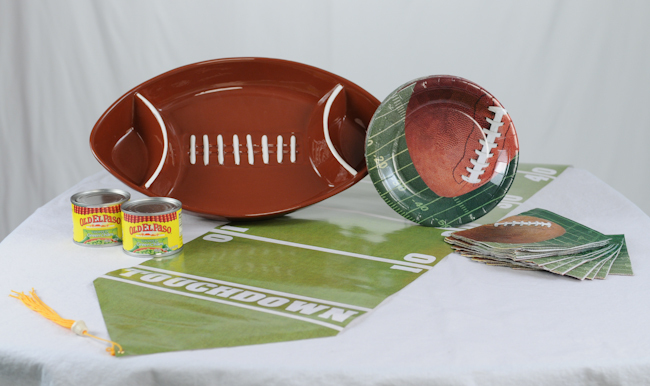 And included in the “Tackle the Taste” gift pack that includes two free 4.5 ounce cans of Green Chiles, as well as a football-shaped ceramic serving platter, two sets of football-themed plates and cocktail napkins, and a themed table runner which arrived in the mail several days ago. In addition, you can win a “Tackle the Taste” gift pack too! The Old El Paso Green Chiles gift pack, product information, online coupon link, and prize packs are provided by Old El Paso through MyBlogSpark, and do not in any way change my opinion of the Old El Paso product. I have been using their green chiles for years and find them useful in any preparation that requires this ingredient. If you would like to win one of these “Tackle the Taste” gift packs please post a comment on this blog post about your favorite recipe that includes green chiles. The contest will run until 2400 EDT on Thursday, January 21, 2010. In addition, the winner will be announced on Friday, January 22, 2010, and contacted for the mailing information. The winner’s physical mailing address will then be sent to the MyBlogSpark.com offices where they will ship out your “Tackle the Taste” gift pack. The winner will be selected by a random number selection system, each comment will be assigned the number in order as they appear in this blog post. This salsa recipe is actually more like a cross between pico de gallo and salsa in that it is quite thicker than your normal salsa, but wetter than your typical pico. I love chunky salsa and the addition of the green chilies adds a small touch of mild heat that otherwise was not there before. Still, my favorite part of the recipe is the cilantro; I can never seem to get enough cilantro. 1. In the bowl of a food processor, add the cilantro, garlic, and garlic salt. Process until chopped fine. 2. Add the remaining ingredients with the exception of the crushed tomatoes. Pulse several times until the tomatoes and onions are chopped and all the ingredients mixed well. 3. Pour out the mixture into a large bowl then add the crushed tomatoes and stir well to incorporate. uh oh I am afraid if I make this for Hurley, that whole bowl will be clean! great salsa recipe. I must make this asap! That salsa recipe is yummy! Delicious! Gots ta try this one! That’s gonna be a great game on Sunday. Awesome salsa! And a great giveaway! I like to make corn muffins with green chilies and white cheddar! My fave recipe with green chilis would have to be homemade chili – a great way to close a cold winter day! The salsa looks awesome!! Thanks for the recipe. My favorite recipe that uses green chilies is in a frittata that also has mushrooms, peeled and seeded roma tomatoes, sausage and cheese. The green chilies add just enough spice to this frittata. Yum! Only problem is whenever I make salsa I eat way to many chips! Yumm.. salsa is a weakness of mine. This looks awesome. salsa is the best! i would love to win that gift pack! @Drick, the 1/2 Tbsp of Worcestershire sauce is not very noticeable, in fact the total yield for this recipe is over a quart of salsa. So the Worcestershire sauce is quite a hidden but subtle background hint. If you want a smaller batch than 1 quart+ you may want to cut the ingredient quantities in 1/2. Yummy – I love green chilies in tamales with some Salvadorean crema on top! I love, love salsa–I canned my own this past summer for the very first time! We have nearly used up all of my jars–I’m in a bit of a panic over this now. Your recipe looks wonderful and I am sure tastes amazing! I might not use W. sauce, but like the idea of trying Braggs or something for a kick–or liquid smoke even? In this house, we always have cans of those green chiles around–I love ’em! Love the salsa. I can never seem to have enough of the cilantro too….such a beautiful herb. that sounds tasty and looks like the perfect cross between a pico de gallo and a salsa like you describe, which tends to be what I like best. we’ll have to keep this one to use, espeically when we start collecting tomatos this summer!!! i’m looking forward to it already. I like to make enchiladas with homemade sauce and green chiles on top. Salsa looks great, congrats on your team winning!! My favorite recipe with green chiles is definitely roasted vegetable enchiladas. A melange of roasted vegetables, seasoned with corn sauce, spiced with green chiles and wrapped in a fresh corn tortilla. The contrast between the sweet corn sauce and the green chiles makes it absolutely delicious. I make my own salsa every weekend…It is fantastic. This looks so yummy…Thanks for sharing. My FAVORITE green chile recipe? I don’t have just one…I use them in salsa, in chili, in queso, in tacos…everywhere I can sneak them! Worcestershire sauce, now that’s one I haven’t tried in salsa Chef. Nice n spicy giveaway too, thanks! Love the beautiful color of this salsa, and I usually like my salsa to have some chunky texture too. The worchestershire sauce is something I haven’t tried before, so sparked some interest for me. Thanks for sharing! oh, i have serious weakness of having too much salsa, especially when facing this delicious home made one! Yum! Great salsa recipe – love using green chilies for a nice kick in omelettes! Thanks for the great recipe I made this today and it was great. Instead of cilantro leaves I added whole cilantro with stem so my was actually more green then red but it was great.